As two new Super Smash Brothers (hereafter SSB) games are in development for Wii U and 3DS, I have been thinking about which characters will be in the game. SSB is my favorite game series. There’s just no other fighter that quite does what SSB does with such class and style. Today I’m going to build my own roster, made up from both my personal desires to characters that I think have a good shot at making it. I’ll discuss characters that I believe will be removed and those that will be replaced. So, let’s get to it! 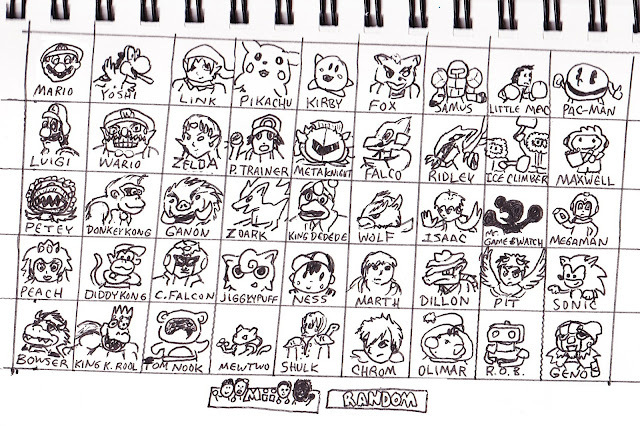 My roster, drawn by me! First, I want to start with Ganondorf. Always considered one of the worst characters, Ganondorf has been a clone-character (meaning uses the same moves as another character) of Captain Falcon. While his moveset has never made sense being that he doesn’t have any of his in-game powers, it’s always disappointing to have a character that plays the same way as another character (only Ganondorf is ridiculously slower!). 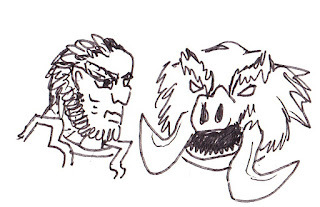 I would love to see Ganondorf replaced with traditional Ganon. 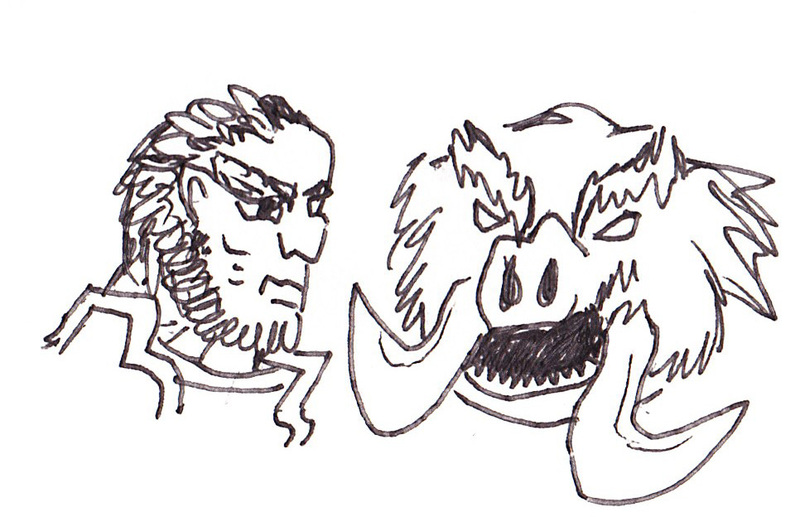 Yeah, the pig-like monster with giant tusks. He can be a Bowser-weight and size character, using giant swords and his traditional magical energy balls and magic. I know that Ganon is used as a Final Smash in Brawl, but I think that should be changed to a powerful dark energy attack. Click the jump to read on! One of the characters in my novel is black, and, after controversies with Rue from The Hunger Games movie (where a bunch of racist white folk were pissed that a black actress played a dear character they assumed was white from the novel), I want to be very clear within the text of my book that she's black. To be colorful or colorless? Most writer's I've talked to say to just not mention what color of skin that any characters have at all, to leave it up to the reader's imagination. However, I feel like this is a little timid on the part of these writers. Why hide the skin color of everyone just to appease certain groups? I want to shove it in the hater's faces that one of my main characters has dark skin and nobody sees her any differently than any other character. It's merely a descriptive value; not a judgement or statement. For context, my book doesn't have anything to do with racial issues. In fact, the characters in my book don't really think about skin color much at all. There are black people, white people, Asians, everything, all mixed. It's perceived more like hair color than race in the fantasy world I've created. These are just a few thought I've been having. I'm trying to figure out a good word to describe her skin color, but most suggestions I get on the Internet say things like, "caramel" or "mocha," but I feel like using food words for skin color is getting a little cliche and seems like just another way for writers to skip over using terms like "brown." If anyone has any thoughts on good words to describe skin color in fiction, please share them. All of this won't really have much affect on the storyline, but I think it's important to acknowledge that there exists more than just white people in the world, and if you don't specifically say so, it seems like most readers will just assume that all characters match the skin color of the author.